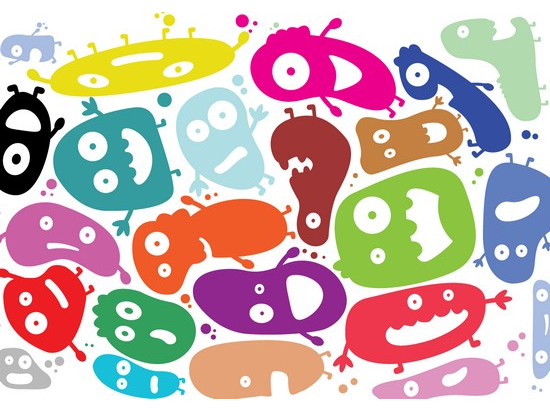 Probiotics in That Gut of Yours | Soothing the Mood and Anxiety Disordered Beast? ‘Psychobiotic?’ Dr. Timothy Dinan and pals from University College Cork (Ireland) have come up with a definition: a live organism that, when ingested in adequate amounts, produces a health benefit in patients suffering from psychiatric illness. About a year ago I posted a piece on probiotics and the mood and anxiety disorders. Several clients have brought the topic up recently, so I decided to tidy-up the article and zing it your way once more. Probiotics – pro (“for”) biotic/bios (“life”) – are live bacteria that assist in maintaining the natural balance of organisms in our intestines. It’s thought the digestive tract contains some 400 varieties of probiotic bacteria that serve to reduce the growth of harmful bacteria, promoting a shipshape digestive system. The most common outside sources of probiotics are yogurt with live cultures, yeast, and supplements. A relatively new field, microbial endocrinology, studies the relationship between our digestive tract and mood and behavior. Researchers in the field have come to the conclusion that digestive system microbes can regulate the endocrine system – the collection of cells, glands, and tissues that secrete hormones directly into the bloodstream, managing our physiological and behavioral activities. Now, the endocrine system is the lead responder when it comes to the stress-hits our bodies take. Without it, and dispatched neurotransmitters and hormones, there would be no fight-or-flight response. Neither would there be the “feel-good” effects of serotonin, dopamine, endorphin, oxytocin, and gamma-aminobutyric acid (GABA). So, according to microbial endocrinologists, here’s the flow: digestive system microbiota influence the endocrine system, which influences our mood and behavior. And that sure as heck equates to gut/brain communication, one of the conduits being the vagus nerve. Interesting how they came up with that. Folks enduring irritable bowel syndrome (IBS) are more vulnerable to feelings of anxiety and depression. Actually, the relationship is reciprocal because both can exacerbate IBS symptoms. Enter the neurotransmitter GABA. When supplies are low, anxiety and/or depression may run high. Digestive system bacteria lactobacillus and bifidobacterium have been shown to produce GABA. And several studies have shown that supplements of either can relieve anxiety in those suffering from IBS. More evidence? The gastrointestinal bacterium clostridium difficile is typically acquired during infancy. It synthesizes at least two toxins that interfere with neurons and possibly the endocrine system. Fascinatingly, those enduring autism and schizophrenia have been shown to have higher than normal levels of this bacterial species. Bottom-line? An imbalance in digestive tract microbiota can manifest as both physiological and emotional/mental woes. And it appears they can be resolved with the use of targeted probiotic – “psychobiotic” – bacteria. “Psychobiotic?” Dr. Timothy Dinan and pals from University College Cork (Ireland) have come up with a definition: a live organism that, when ingested in adequate amounts, produces a health benefit in patients suffering from psychiatric illness. The team noted that gut microbiota can change on a daily basis. And there’s even evidence that the form of birth (vaginal or C-Section) can alter one’s microbiota. But there’s more. Early life stress, such as maternal separation, is known to induce long-term changes in the microbiome. Dinan and the bunch reviewed a study that assessed the potential benefits of a specific probiotic in rats displaying depressive behavior due to maternal separation. Turns out probiotic treatment normalized their behavior, as well as their previously abnormal immune response. Some probiotics have even been shown to have anti-inflammatory effects. And that’s huge because both depression and stress are associated with inflammation. Now, as exciting as this is, you have to keep in mind that only a small percentage of probiotics can be considered psychobiotics. And there’s much work to be done on identifying them. Actually, the Alimentary Pharmabiotic Centre (APC) at University College Cork is now looking to develop psychobiotics as “medical foods” with an industry partner. Dang, there’s just so much great research going-on these days in an effort to bring relief to folks enduring mood and anxiety misery. So often it involves chemicals that hold the potential to harm our brains – our bodies. But here we have a creative relief proposition that comes off as being so safe (okay, I’ll say it – “natural”). Yeah, lactobacillus and other pro/psychobiotics. Perhaps a new age answer to major depressive disorder, the anxiety disorders, and other tormenting emotional/mental situations. I can handle that. Plenty more Chipur titles where this came from. Need to bounce ideas, troubles, etc. by a clinician? Consider a consultation. Looking for a dedicated and creative coach/mentor? Count me in.